I need your opinion on what color of sashing for a wall quilt I am making. It's a challenge. I have to use 4 of the fabrics that came in a bag I bought. I used them in the flip flops. Now I need an opinion on the sashing. There's a $25 giftcard for a LQS to be awarded to the winner. The customers will be voteing. Both look great but if I had to choose, it would be the pink! I think the blocks show up better on the pink. Great job on the flipflops - are they three-dimensional? Love them both! But I agree the second one is a bit better! Flip flops remind me of blue water at the sea side, so I would prefer a blue sashing if possible!!! I really like the pink. Beautiful flip flops. Good luck on the challenge. There is something about the pink that makes it looks really nice, perhaps it is the pattern in the fabric? Very cute flip-flops! I like both. Since you have 5 blocks, have you thought about putting them on the diagonal? I like the pink too if you're only using one - but have you considered using both? Frame the (very cute!) flip flops in alternate colors? I love them both, I guess if I have to choose I will pick Hmmm Pink!!! THANKS EVERYONE!!!!! I thought the pink too. Yes, they are kinda 3D. I used ribbon for the straps & buttons on some, and the others are embroidered. OOPS! 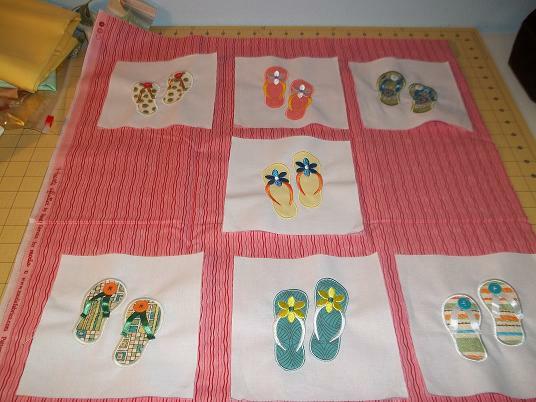 I guess I should have mentioned I am going to embroider Flip Flops for Summer in the blank blocks. I love the pink as well!! I love the idea and the embroidery treatments. my fav color is pink and aqua but the yellow looks more summery to me. Of the two, definitely the pink. The blocks stand out better. Yep, pink and what about a binding that would look like sand? 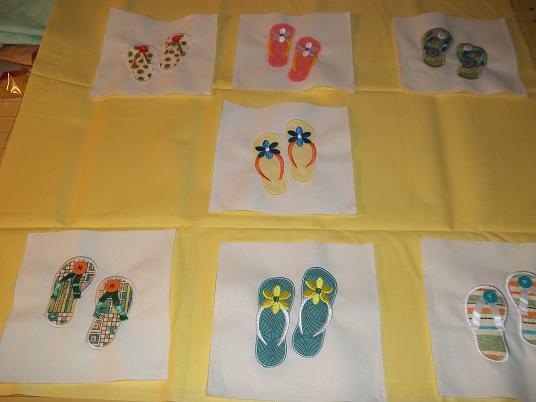 Or the fabric that is in the top right pair of flip-flops? Flip flops are so cute! The pink looks better. Any dark color for contrast would look good. Love the flip flops! I think the pink makes them pop more. Thanks everyone, I took your advise and went with the pink! I'll post it. Pink is better of two but agree blue would pop it.